It’s hard to believe that it is over a decade since the launch of FromVineyardsDirect.com, founded in 2006 by business partners David Campbell and Esme Johnstone, two men with extensive experience in wine, though experience that could hardly contrast more. David Campbell is best known for his Everyman Library publishing house, but before that he created and published France’s leading wine guide book, Le Guide Hachette. Johnstone on the other hand is both retailer and winemaker, having revolutionised the UK wine trade when he founded Majestic Wine Warehouses, later selling-up and buying Château de Sours in Bordeaux, whose rosé wines in particular rode the crest of the pink wine wave, becoming firm favourites of UK consumers. Initially the pair used their extensive network of contacts to source a terrific and well-priced, but almost entirely French list. The portfolio was deliberately limited in size to allow them to work directly with growers with whom they had a close relationship, including wines de-classified from famous Classed Growth Bordeaux properties that insiders latched on to immediately. The range soon extended to Italy and Spain, whilst remaining niche, and over the decade since their net has widened further, with wines from Argentina, South Africa and Portugal for example. But the philosophy of establishing one to one relationships with their growers remains central to the business model here, sourcing direct from the estate and selling direct to their customers, with no layer of ‘middle men’ in the picture. 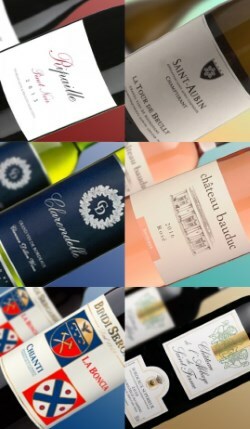 This selection of 12 wines is part of FVD’s extensive portfolio. FVD delivers free in the mainland UK for orders of 12 bottles or more. There’s a small charge for deliveries of fewer bottles, and the prices quoted below drop by £2.00 per bottle if you want to pick the wines up from their warehouse in France. Full details on FromVineyardsDirect.com. (2017) Vibrant and zesty, very modern Sauvignon from English-owned Château Bauduc, this sings in the glass with its pungent elderflower tempered by a blast of gooseberry and plenty of citrussy spark. In the mouth passion fruit and orange are bright and shimmering, yet something - a touch of peach, a hint of yellow plum - adds softer flesh before a pin-sharp finish. (2017) A blend of Grenache blanc, Marsanne, Viognier and Bourboulenc, the nose here is surprisingly delicate, just a touch of white flowers to zesty citrus and apple skins. In the mouth it has the texture and acid grip of so many white Rhône blends, a juicy but taut and pithy lemon character, just a touch of Viognier peachiness softening the edges a touch. (2017) What a delightful white Burgundy this is, a mini-Chassagne from the highly respected Roux family, a beautifully pitched oak component adds nuttiness and cream to the flinty, stony mineral and citrus nose. In the mouth it has lovely definition, the acid framework cleaves through the richness and sweetness of the ripe Chardonnay fruit, but it's that flinty terrroir aspect and lick of salts that gives such class and such interest. (2017) A Loire wine for those who don't like their Sauvignon Blanc too tropical or too green, this pale-coloured, mineral example has stony aromas, citrus and the vaguest suggestion of nettle. In the mouth the 65-year-old vines grown on limestone soils give a natural concentration and bit of grip, the fruit taut with melon rind and lemon peel flavours, that little stone and salts note there in the acidity of the finish. (2017) I see from my database that I have notes for the 2005, 2006 and 2007 vintages of this wine from Clarence Dillon Wines, making it part of the Haut-Brion family stable, so interesting to taste this latest release. It's a typical white Bordeaux blend of Sémillon, Sauvignon Blanc and Muscadelle, the nose clear and brightly focused, with citrus and a touch of riper red apple, maybe even peach, and a light mealiness. Medium bodied, this has a grapefruit and lemon grip, a bit of real steel at the core, draped with taut fruit, the slight chalkiness of the acids giving lovely gastronomic potential. (2017) What a thoroughly lovely Bordeaux pink this is, a delicate blend of 60% Cabernet Franc and 40% Merlot made in a pale, Provence style, picked early so there is a zip and zing to the red fruits and the acidity, little watermelon and pomegranate notes mixing with redcurrants, before a free-flowing palate with just a bite of tannin to add a savoury edge, and a crisply defined finish. (2017) A Pinot from the Languedoc, this has certainly retained freshness and edge in the heat of the south, with only 12.5% alcohol and a crisp, herb and red fruit nose. It's a Pinot in an authentically light- to medium-bodied style, fragrant and staying crisp and refreshing. The antithesis of 'blockbuster', but lovely of it's style. (2017) Though Bindi Segrardi's Chianti Classico Riserva 2014 is a stunner, I really enjoyed the herbal, lighter character of this wine sourced from Bindi Segrardi's vineyards across the Chianti region. The nose has rhubarb, beetroot and basil, giving that vegetal, herby edge to the light tobacco and cherry fruit. On the palate it is medium bodied, with a nice silky texture, and plenty of sweet fruit is underpinned by a roughening edge of tannin, pert acidity and more of that herby character. A classic style, and please watch the video for more information and food matching ideas. (2017) A Riserva that spent 15 months ageing in oak barriques, followed by the same period in bottle, this is all Sangiovese and seems immediately polished and classy with its taut graphite and black fruit nose, touches of aromatic tobacco and yet all very focused. In the mouth there's an almost surprising weight and density of fruit - so full and rich after the lean suggestion of the nose, expansive in fruit and tannins, a cherry pit dryiness to the acidity and then that wisp of smoke and tobacco curls into the finish which is long, the mineral and graphite polish asserting. What a terrific Chianti for drinking now, or cellaring. (2017) From a very good vintage for Bordeaux, this Merlot-dominated blend is bright and perky, the bold and juicy fruit to the fore in a buoyant, youthful style. In the mouth, more of the same with rounded Merlot softness driving the picture, fairly straightforward stuff, but good balance and nicely quaffable stuff. (2017) Is this the best value in the selection of FromVineyardDirect wines I've been tasting? Arguably yes, because it's a truly lovely Bordeaux made from Merlot and Cabernet Sauvignon and coming from the fabulous 2010 vintage. With 14% alcohol the wine is plush and rich, heaving with black fruits, edged by spices and cedar, but such a deep pool of blackcurrant. Rich and full in the mouth, the copious fruit is matched by smooth tannins, elegant cherry acidity and a nice fleetness of foot in the finish. Watch the video for more information and food-matching ideas. (2017) Last tasted in 2015 when I rated it 90/100, this is cellaring very well indeed, still showing that ripeness of fruit that is modern and appealing, but not at the expense of classic Médoc character, a hint of game, cedar and liquorice, a pleasing dose of volatility leading on to a curranty, dry palate, but there's a slick chocolate to the tannins, the 14% alcohol no doubt aiding that generous mouthfeel, into a long finish where the sweet fruit persists.